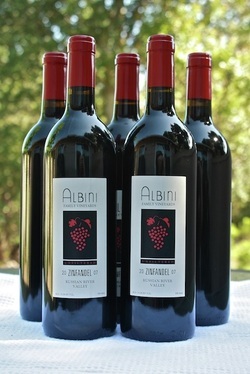 Albini Family Vineyards was established in 1991 and produces about 500 cases of handmade wine each year. Although we are small, our Merlot and Zinfandel wines receive national attention for their high quality and unique style. We are proud of our artisan style of wine making, which follows a natural, hands-on approach. At 2 to 3 tons per acre, our vineyard yields are low and all of our grapes are handpicked and sorted to assure only the highest quality fruit is used. Fermentation takes place in small, open-top fermenters utilizing indigenous (wild) yeast and the cap is punched down 3 - 4 times a day. Once the wine is dry, it is pressed in a 1/2 ton basket press and then hand bucked into barrels. Our Russian River Valley Merlot is aged for 20 months in a mix of French and American oak barrels. The Zinfandel is aged for 18 - 20 months in primarily American oak barrels. Both wines are unfiltered and hand-bottled at our estate winery in Windsor, California. We very much appreciate your interest in our wines.